A Fair Hat for the Fair! 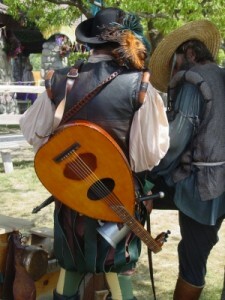 Spring and summer are wonderful times for enjoying Renaissance faires and festivals, and the time outdoors is enjoyable for the entire family. The wonderful experience of watching live action role playing activities provides a rich opportunity for the imaginative child to visualize Medieval times. It’s important, though, to take appropriate health precautions at such an event, as the early warm weather days are so beautiful that it’s easy to forget the potential for sunburn and heat sickness. Renaissance hats provide you with a fun way to protect your children’s heads from the harsh rays of the sun. Renaissance hats are crafted in many interesting styles for both boys and girls. A coachman hat provides a fun choice for your child, and it will nicely shade his head and face in the process. Likewise, Musketeer or pirate hats provide fun, Medieval themed choices that will also shade tender little heads. Crowns and bonnets will not only shade your daughters’ heads but allow them to enjoy the frilly feel of role playing Medieval ladies and princess parts. You can search for a fun choice in advance of the summer Renaissance fairs or you might find a fun design while you are exploring a festival.